On approaching the castle he found that the drawbridge was not lowered. His pursuers were close behind him, and he had not even time to wind his hunting-horn, and warn the inmates of his return. It was a critical moment, and the noble animal on which he rode seemed fully to understand the danger. No application of spur or whip was needed. Exerting his full power, the horse leaped across the terrific chasm— clearing at one bound twenty-five feet—and landed his rider safe on the other side! Lord Oliphant’s leap was long talked of in Caithness, and was a familiar saying among the people. * Between this old tower and Wick some geological appear­ances of a curious and rather puzzling kind present themselves. The cliffs in this quarter are about thirty feet in height, and their upper strata would appear to have been deranged by some extraordinary convulsion. Enormous masses of rock have been broken off from their beds, and thrown upon one another in most terrific confusion. One vast mass, apparently more than two hundred tons in weight, has been reft from its original bed, and tossed up on a similar layer immediately above it. Between the masses is a smaller rock, on which the one that has been hurled up rests in a most perilous position, looking as if “an infant’s touch could urge its headlong passage down the verge.” Theorists keenly differ as to the cause of this singular disruption. Some ascribe it to the force of the sea during some more than usually heavy tempest from the German Ocean; others, who are advocates of what is called the glacial theory, maintain that it is the result of ice action at one of those infinitely remote eras in the geological history of the globe, which ingenious men, by the aid of a lively imagina­tion, have described so eloquently. Icebergs driven against the cliffs with prodigious fury, in their estimation, sufficiently account for the entire phenomena. * The Oliphants were an ancient family, and possessed of considerable property in the county. They were superiors, it is said, of one-fourth part of Caithness. In 1606, the last Lord Oliphant sold all the lands he had in it to the Earl of Caithness. The family is now quite extinct. Thurso, which lies about twenty-one miles to the west of Wick, is also situated at the mouth of a river, close by the sea. Etymologists differ about the origin of the name. Some suppose that it is so called from Horsa, a Saxon general, who, it is said, landed there some time in the fifth century, and plundered the county. Others, and among them Mr Worsaae, derive the name from the Icelandic term Thorsaa. In the pagan mytho­logy of the Scandinavians, Thor was the title of one of their principle deities; and in the old Norse, signifies a river. Hence Thorsaa, or Thor’s river. This latter derivation seems the more probable. The name of the river was afterwards extended to the town and the surrounding district. Thurso was a place of great note in ancient times, and there is frequent mention of it by Torfaeus. In one place he calls it “oppidum Cathneiae,” the town of Caithness. It has been the scene of some remarkable events, and its environs afford a number of Norwegian memorials. At Ormlie, on a rising ground closely adjoining the new town, stood the Castle of Thurso—the “castrum de Thorsa” of Torfaeus—in which the old Scandi­navian earls of the county used frequently to reside. Of this once famous stronghold not a vestige is now to be seen. In clearing away the foundations of the ruins, some years ago, the workmen discovered the well, which was about twenty feet deep. The modern house, named Castle-green, stands nearly on the site of the ancient structure. Thurso was, by royal charter of Charles I., constituted a free burgh of barony in 1633, in favour of John, Master of Berriedale, who frequently resided in it. The seal of the burgh represents the figure of St Peter and the keys, with a tall staff crossed at the top, having the motto, “Sigillum Burgi de Thurso in Caithness.” In 1726, according to the M’Farlane Manuscript, it was four times as populous as Wick. The population by the last census was 3426. For nearly two centuries Thurso was the chief seat of the Sheriff Court of Caithness, and the residence of the several legal functionaries. But at length the superior and magistrates of Wick, considering this an usurpation of the just rights of the burgh, brought the case before the Court of Session, when a decision was given in their favour, and the Sheriff Court was in 1828 removed to Wick. * Thurso was, in consequence, shorn of much of its public importance ; but it has survived the heavy blow and great discouragement, and is now progressing rapidly, both as respects internal improvements and increase of commerce. * The transference of the courts from Thurso to Wick took place in terms of the decree of the Court of Session in an action at the instance of Earl Gower and the magistrates of Wick against G. Douglas and others. 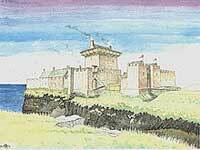 Wick being the royal burgh, and there being, moreover, several statutes ordaining the Sheriff to hold his courts there, the Court of Session found that the Sheriff was bound to hold his regular stated courts at Wick, without prejudice to holding courts at other places, in terms of the 20th Geo. II., c. 43. And further, that the Sheriff-clerk’s office must be situated at Wick. For a particular account of this case, vide Shaw and Dunlop’s Decisions, vol. vi., pp. 650-657. In point of situation, Thurso has greatly the advantage of Wick; and the surrounding landscape has been much admired by strangers. The view, as you approach it from the east­ward, is particularly striking. Immediately before you, stretching along the west side of the river, over which there is an excellent bridge of three arches, lies the town. About two miles further west you see the celebrated roadstead of Scrabster, with a long ridge of Holborn-head ; and, immediately opposite, about two leagues to the north-east, Dunnet-head, at the western entrance of the Pentland Firth. On the hill of Clairdon, some two miles from the town, in an easterly direc­tion, appears Harold’s Tower, a monument erected over the grave of Harold, Earl of Orkney and Caithness, who was slain there in battle in the twelfth century. From the point of Clairdon, near this monument, all along the shore to Holborn­head, swells in the beautiful Bay of Thurso. To the north, in the back-ground, tower up the lofty summits of the Hoy hills in Orkney. Near the mouth of the river, on the east side, is Thurso-east, the seat of Sir George Sinclair of Ulbster. The edifice, though of late considerably modernised, is said to have been erected about the year 1660, by George, the sixth Earl of Caithness of the Sinclair family. Miss Sinclair, speaking of the old castle, says —“In stormy weather, the sea spray has sometimes passed over the roof. Fish have been caught with a line from the drawing-room window; and vessels have been wrecked so close under the turrets that the cries of the drowning sailors could be heard.” Thurso contains some handsome new streets and houses; but the finest building of the whole is the new parish church, which is in a superior style of architecture, with a lofty tower and clock, and cost about £6000. In a square, opposite the east end of the church, is a statue, by Chantry, of Sir John Sinclair, in his uniform as colonel of the Rothesay and Caithness Fencibles. 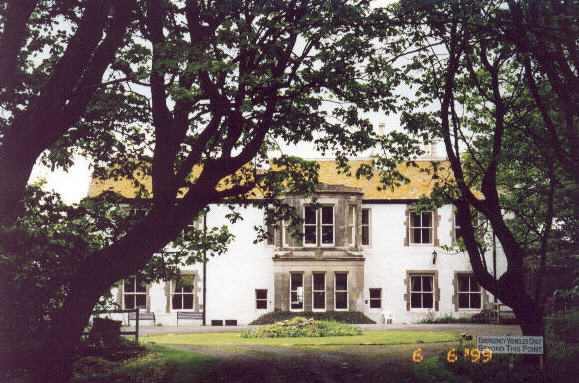 Among the recent buildings is an academy, to be named the “Miller Institution,” after its founder, Mr Alexander Miller, of Thurso, a benevolent gentleman who has been at the sole expense of the erection, and has set apart a fund, we believe, for the maintenance of the teachers. There is also a female school, in which young girls of the poorer class are taught gratis. This Institution, which has been productive of im­mense good, was, much to their honour, originally got up by the ladies of Thurso by means of voluntary contributions, and is chiefly, if not altogether, supported in this way. The river of Thurso, which is the largest in the county, is valuable as a salmon-fishing stream, and has been long cele­brated for the abundance and the excellent quality of the fish caught in it. In the month of July, 1743, no fewer than 2560 salmon were taken in this river at one sweep of the net. The circumstance, though it looks somewhat incredible, is confirmed by the written attestation of the chief magistrate and other two respectable inhabitants of the town, who were present at the time. In this document, which still exists, it is stated that this extraordinary draught took place in the cruive pool above the town; that the net containing the salmon was carried down the water by from eighteen to twenty men, with long poles in their hands keeping down the ground rope, and that the fish were afterwards taken ashore by degrees in a smaller net. About the end of the last century, the shore dues at the river mouth, then the principal harbour, were only one shilling and sixpence, but from this charge vessels belonging to the port were exempted. The river of Thurso has its rise in a small brook among the hills on the confines of Sutherland. At the distance of eight miles from its source it enters Lochmore. Issuing from the outlet at the north corner of this lake, it proceeds onwards through a pretty wide extent of country. Some of the locali­ties through which it passes, especially in the upper parts of the parish of Halkirk, possess features of no ordinary beauty. The scene at Dirlet is particularly romantic. Here the banks on each side are steep, and richly clothed with brushwood; and on the summit of a precipitous, rock, said at one time to have been surrounded by the river, arid accessible only by a drawbridge, may be seen the ruins of a castle which, about the end of the fifteenth century, was inhabited by a chief of the name of Sutherland. After a winding course of nearly thirty miles, during which it is fed by many smaller tributaries, the river finally flows into the Bay of Thurso. I have already noticed the greatly improved condition of Caithness. This is abundantly shown by the large increase in rent,* and the extraordinary rise in the value of landed pro­perty in the county since the beginning of the century. One striking instance of the increased value of land may be mentioned. About the year 1788, the late Sir John Sinclair of Ulbster purchased the estate of Langwell for £7000. He sold it in 1813 to the late Mr James Home, writer in Edin­burgh, for £42,000; and Mr Donald Home, who succeeded to the property on the death of his uncle, lately sold it to the Duke of Portland for £90,000. In other departments, such as the rearing of stock, the pavement trade,* etc., Caithness is making the same remarkable progress; and, indeed, it may be said the material resources of the county are only beginning to be developed. The present proprietors who have most dis­tinguished themselves for their agricultural and other improve­ments are the Earl of Caithness, Sir George Dunbar of Hempriggs, Sir John Sinclair of Dunbeath, Mr Sinclair of Forss, Mr Traill of Ratter, and Mr Henderson of Stemster. And here it is but proper to mention two gentlemen to whom the county of Caithness is largely indebted, namely, Mr William Darling and Mr James Purves. Mr Darling was, for a considerable time, manager at Stirkoke for the late Mr Home, Sheriff of Haddington; and Mr Purves was for several years also factor for the late James Traill, Esq. of Ratter. Possessed of great intelligence, and thoroughly acquainted with the best mode of husbandry in the south, of which they are natives, they introduced the system, as far as it was practicable, on the estates under their management, and showed in a very satisfactory manner what great improvements, superior skill, combined with a judicious outlay of capital, could effect on a soil not naturally rich, and in a changeable climate like that of Caithness. In the agricultural annals of the county their names will have a permanent place. Caithness is divided into ten parishes, quoad civilia, and composed of highlands and lowlands. In the former the Gaelic language is spoken, and in the latter the English, or rather a dialect of the Scotch, with some provincial peculiarities. The Gaelic, which is said to be not of the purest school, is fast disappearing before the march of education; and Caithness may in truth be called a lowland county. In 1801 the population was only 22,609. By the last census in 1861 it amounts to 41,216. *In chapter xiii. will be found some account of the origin and progress of the Edinburgh Caithness Association.